Waterloo Sparring Group | Historical fencing in the heart of London, every Saturday. Waterloo Sparring Group – Historical fencing in the heart of London, every Saturday. Eleven of us attended on Saturday for a very energetic and fun session including case of swords, longsword, smallsword, sidesword, sabre, and sidesword & buckler. A contingent, as ever, also attended the Norway HEMA Open 2017 held in Oslo hosted by Fektklubben Frie Duellister; entering women’s longsword, men’s longsword and open rapier & dagger. 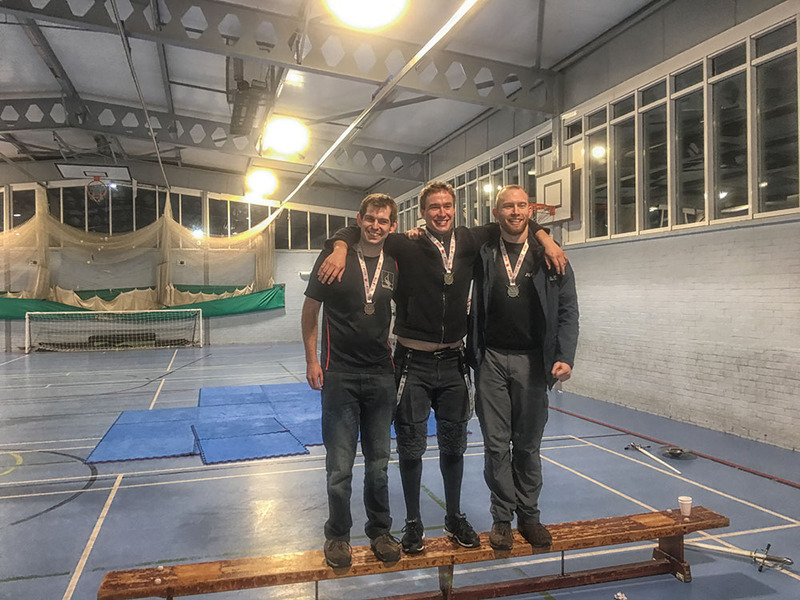 Huge congratulations to Pim and Sasha who fought each other in the final to win Gold and Silver respectively, and best wishes for a swift recovery to Michela who took an injury whilst competing. The next event is the May Melee in Bath, followed by the Horned Crown in Wexford and the Sweden Open in Kristinehalm. These are respectively the second leg of the IHFL, and the final leg of the NHFL where the overall winners of each category will be announced. Will WSG be in store for more prizes? Watch this space. Three medals from three different tournaments, congrats to Mike and Artur! A handful of brave souls are off to the Big Moscow Tournament this weekend. The rest of us will be in Southwark, as ever. Bring swords. Bring friends with swords. …the first international Bartitsu sparring video competition, for prizes of up to US$1000! The contest is open to martial artists and combat athletes of any style(s) and its object is to help fulfil the Bartitsu Society’s mission: “to continue the legacy of martial arts pioneer E.W. Barton-Wright”. We are happy to say that WE WON! Congrats also to James and Masha, who represented the group and fought valiantly. WSG is now #2 in the Nordic League’s Club Ranking, which is pretty awesome for being in the wrong geographic area! This weekend we were visited on Saturday by Jonathan Burke from the Lionheart HEMA club in Taiwan, who’s on a tour of the UK. He fought almost everyone attending at least once. He took his (literal) bumps with good grace, too, after in-advisably closing on our pet Ringen-Rancor. Several WSG regulars (Peter, Jamie, Claudia) journeyed to the home club of semi-regulars Tea and Merlin – Cambridge HEMA. Jack Gassmann led a seminar of sparring games followed by several hours of sparring. Fun *and* educational! Pim and Sasha are in the rapier finals at Helsinki Open 2017. Best of luck to both! We don’t know the result, but that means WSG have their first Gold and Silver of 2017 secured. A bit late for the website update, but a bunch of WSG attendees went to SwordFish. Congratulations are especially due to those who made it to the livestream: Piermarco Terminiello, with a bronze in rapier and dagger, Jack Gassmann with the technical prize in sword and buckler, on a knackered leg to boot, and Peter Smallridge with a wrestling heavyweight silver, and Michela D’Orlando who came fourth in the women’s longsword. Back in Surrey, there was the Broadwater Bucklerthon, a rather more local event featuring both a novice nylon and invitational steel sidesword and buckler tournament. It’s great to see such effort put into building competitors here in the UK, and there were some familiar faces on the podiums. And of course, WSG sessions continue in its usual slot. 11am, Colombo Centre. Bring swords! Congrats to Masha for her silver medal in the Women’s Longsword at TaurHEMAchia 2016, and to all who went and competed. Those who stayed at home enjoyed the last of the warm weather with a barbeque and cutting party. Cardboard tubes were ravaged, and much meat devoured. Tomorrow, we’re hosting “HEMA Godfather” Matt Galas! We had chocolate cake. It was good.